Interested in Genome-Mining for Natural Products? 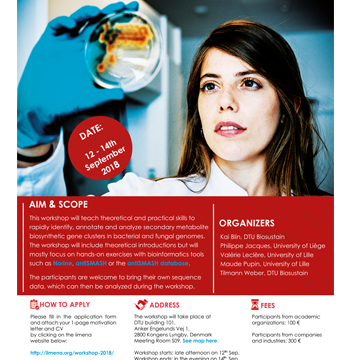 From Sept 12-14, 2018 we are hosting a hands-on workshop for early-career scientists at Technical University of Denmark near Copenhagen. Find more information here. The MEDINA team was present at the I Euroindoamerican Natural Products Meeting; May 29-June 1, 2018. Madrid, Spain. A poster with title The IIMENA project: integration of informatics and metabolic engineering for the discovery of novel antibiotics was presented. 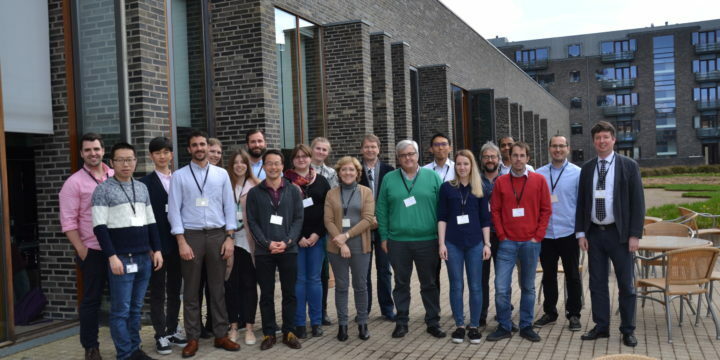 The first annual meeting of the IIMENA project funded by a Challenge Grant of the Novo Nordisk Foundation was held in Copenhagen, Denmark on 17th of April, 2018. The meeting was hosted by the Technical University of Denmark, a coordinating partner of the consortium. The meeting allowed the partners to present what they have done in the first year as well as the next steps and plans for the years to come. A picture called “Fungal competition” authored by Rachel Serrano, researcher at Fundación MEDINA, has won the modality of sustainable agriculture of the Fotciencia”15 contest. The picture shows the result of the confrontation between an endophytic fungus, living inside plant tissues and a phytopathogen using a co-culture technique. It allows the in vitro simulation of microorganism’s interactions that may happen in their natural environment. The endophytic species Dothiora sp. (black fungi) faced the phytopathogen strain Hypoxylon mediterraneum (white fungi) for 14th days in a Petri plate and an agar environment at 22ºC. Both microorganisms might be detecting each other’s presence through the diffusion of environmental signals, generating an antagonistic reaction that inhibits the phytopathogen growth. We can observe how the H. mediterraneum´s hyphas are restrained and cannot invade its opponent. New studies have recently demonstrated the relevancy of this technique for the induction of new secondary metabolites. Find more information here. On Feb 9th, four DTU scientists met at Fundación Medina in Granada to discuss the progress of the screening-related work packages of the iimena Challenge Grant project. “It is great to see the progress of our project and the interaction of our groups”, says Tilmann Weber, the iimena coordinator. “I’m really excited now on the next steps, where we will determine the full genome sequences of the strains that were so far identified in the screenings against our panel of clinical pathogens and perform Genome Mining studies on these strains”. Fundación MEDINA keeps working on the investigation of new antibiotics and is one of the three participants of the Project IIMENA “Integration of Informatics and Metabolic Engineering for the discovery of Novel Antibiotics” financed by the Novo Nordisk Foundation. This new 7.7 M euros research program is led by the new center DTU-Biosustain (Novo Nordisk Foundation Center for Biosustainability) of the Technical University of Denmark and counts with the active participation of Fundación MEDINA and KAIST, the Korea Advanced Institute for Science and Technology. Find more information here. Antibiotics are a product of nature, and researchers have sought and found many new antibiotics in fungi and bacteria since penicillin was first discovered in 1928. The overuse of most antibiotics in animal feed and antibacterial treatment has led to a massive increase in antibiotic resistance. This has led researchers to seek completely new types of antibiotics – using novel methods. Find more about it here. The job positions in the iimena project are now filled. The job positions at DTU are now filled. Congratulation to Xinglin, one of our talented researchers working on finding new antibiotic drug candidates in the IIMENA project. Dissemination of antibiotic resistance genes from antibiotic producers to pathogens. Read more about his paper here.